Anna Matilda (née McNeill) Whistler (September 27, 1804 – January 3, 1881) was the mother of American-born, British-based painter, James McNeill Whistler, who made her the subject of his famous painting Arrangement in Grey and Black No.1, often titled Whistler's Mother. Anna McNeill Whistler was born in Wilmington, North Carolina, to Charles Daniel McNeill (1756 - 1828), a physician, and Martha Kingsley McNeill, daughter of Zephaniah Kingsley, Sr. (one of the founders of the University of New Brunswick) and youngest sister of Zephaniah Kingsley, Jr. (a slave trader and plantation owner, and the husband of African-born Ana Madgigine Jai). In 1831, she married George Washington Whistler, a civil engineer and former army officer,[dead link] a widower who had three children. She gave birth to two sons, James McNeill Whistler and William McNeill Whistler. Her husband soon accepted a job in Russia as a railway engineer between Moscow and St. Petersburg. She had a son named Kirkie who died age four. A son named Charlie also died before Anna had moved to Russia. When James was nine, his art brought the attention of Scottish painter Sir William Allan. Anna then enrolled James in the Imperial Academy of Arts at St. Petersburg. Her husband died in 1849 from cholera. Anna returned to the United States, to live in Connecticut. Her daughter remained in England after marrying a surgeon. It was then the family lived in poverty but her daughter helped William and James attend private school. James entered West Point just before his 17th birthday, was expelled soon after, and moved back to England. Her son William became a surgeon in the Confederate Army during the American Civil War. In 1863, at the advice of her stepdaughter and son, she moved to England, moving in with her son James in London. She later relocated to St Mary's Terrace, Hastings, east Sussex. She was surprised by her son's "flamboyant Bohemian lifestyle"; however, she tolerated it, and befriended some of his friends as well. This was around the time the famous painting was made, although it was not the only one. Anna was 67 during the painting of the picture. She died a decade later and is buried in Hastings Cemetery. Whistler's Mother: the Life of Anna McNeill Whistler, by Elizabeth Mumford. Plutarch Press (1971). ^ May, Philip (January 1945). "Zephaniah Kingsley, Nonconformist (1765–1843)", The Florida Historical Quarterly, 23 (3), p. 145–159. ^ Whistler's Mother Anna McNeill Whistler Famous Mothers. 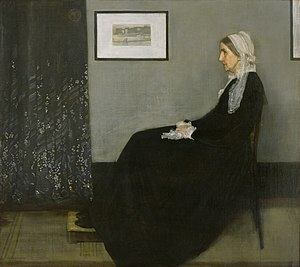 Wikimedia Commons has media related to Whistler's Mother by James McNeill Whistler. This page was last edited on 2 February 2018, at 23:08 (UTC).